Someone started selling fresh fish market. He put a notice board reading "Here Sell Fresh Fish" Not long afterwards there came a visitor who asked about his writing. "Why did you write the word HERE? Did not everyone already know if you're selling HERE, is not there? "That's true!" Thought the fish seller, and the abolition of the word "HERE" and stay with the words "FOR SALE FRESH FISH." Not long after came the second visitor who also asked his writings. "Why do you use the word FRESH? not all people already know if you are selling fresh fish, not the rotten fish? " "It also" thought the fish seller, and the abolition of the word "FRESH" and stay with the words "SELL FISH". A moment later came the visitors to the three who also asked writing: "Why did you write the word SALE? Did not everyone already know that this fish for sale, not on display? " 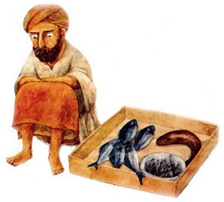 True also thought the fish sellers, and abolition of the word SALE and there lived the words "FISH"
Some time later, the visitors came to 4, who also asked his writing: "Why did you write the word FISH?, Would not everyone already know that this fish is not meat?" "It also" thought the fish seller, and the revelation of the announcement board.